James E. West, a research professor at Johns Hopkins University’s Whiting School of Engineering, is best known as the co-inventor of the foil-electret transducer, an inexpensive but highly sensitive device that revolutionized the sound industry and is now the basis of sound transmission in most cell phones, hearing aids, professional microphones, and other acoustical equipment. In a career at Bell Laboratories that spanned more than forty years, he earned 47 U.S. and over 200 foreign patents for a range of technological inventions and innovations. West was born in the rural community of Farmville, Virginia. His interest in electricity was sparked when he was about nine years old and plugged an old radio into an outlet while standing on a metal bed on a humid day. An electrical charge temporarily paralyzed his body but made a more lasting impression on his mind. His brothers rescued him by pulling him away from the outlet, but the experience left him determined to explore and understand electricity. He pursued a career in electronics despite his parents’ warnings that as a black man in the era of segregation he would never find professional employment in that field. Other members of the family worked in the only professions then open to African Americans: law, medicine, teaching, or theology. He entered college as a premed student at Hampton University, but was drafted to serve in the Korean War. When he returned, he transferred to Temple University and switched his major to solid state physics—thereby losing his family’s financial support. In the mid-1950s, while still in college, he worked as a summer intern in the Acoustics Research Department at Bell Laboratories in New Jersey. After completing his studies at Temple University in 1957, West took a full-time position as an acoustical scientist at Bell Labs. When a group of acoustical psychologists needed instruments to research the subtleties of human hearing, West and a colleague, a German-born physicist named Gerhard Sessler, developed the foil-electret transducer (also called the electret microphone), which proved far more sensitive to sound than previous carbon microphones. An electret is a material that holds an electric polarization (negative and positive charges) after being exposed to a strong electric field. West and Sessler used a metal-coated polymer film with a permanent charge to convert sound to electrical signals. The device, patented for Bell Labs in 1962, was highly accurate, compact, and inexpensive to produce. West continued his research at Bell Labs and its spin-off company, Lucent Technologies, until his retirement in 2001. He joined the faculty of the Whiting School of Engineering, Department of Electrical and Computer Engineering, in 2002. During his career, he has authored or contributed to over 140 professional publications. West has also dedicated himself to mentoring and expanding opportunities for minorities and women in science, technology, and engineering. 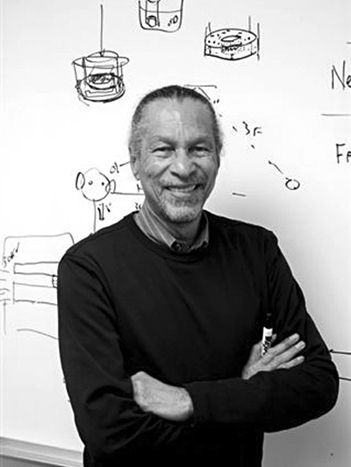 West was elected to membership in the National Academy of Engineering in 1998 and inducted into the National Inventors Hall of Fame in 1999. He is a fellow of both the Institute of Electrical and Electronics Engineers and the Acoustical Society of America (where he was elected president in 1998). Awarded honorary doctorates by Michigan State University and the New Jersey Institute of Technology, West has also received numerous other distinguished professional honors, most notably the 2006 National Medal of Technology, the nation’s highest award for technological innovation.